In last week’s blog we discussed wrought iron railings as an elegant option for both commercial and residential spaces. This week, we continue our feature on these handrail systems by highlighting the impact they bring when paired with curved staircases. As you can see in our project photos displayed above, the combination of curved stairs and wrought iron handrail systems offers a striking and pleasing focal point to any professional or residential location. A classic, beautiful, and high-end design, wrought iron railings often serve as the main distinguishing element of a staircase. Adding elegance to any curved staircase or balcony, these ornate railings stand for both quality and aesthetics. In order to deliver the finest quality ornamental metal to our clients, we employ a team of expert craftsmen who hand forge wrought iron handrail systems in our metal fabrication facility. These talented artisan welders forge railings of all types and designs, crafting wrought iron pieces to match each client’s space and vision. Our ornamental metal portfolio includes projects from traditional to modern and everything between, and our team’s extensive capabilities offer limitless options to our clients. Whether a client selects a style from our extensive inspiration catalog or works collaboratively with our creative designers to develop a one-of-a-kind custom wrought iron handrail system, our experienced team works to bring each unique vision to life. From inspiration to installation, we provide ideas, guidance, and expertise to ensure that each ornamental metal project exceeds expectations. Our designs range from simple designs with wood and knuckle balusters, to elaborate Tuscan scrolls with intricate details. For clients seeking luxurious, regal designs, we can even accent our ornamental metal with beautiful gold leafing. Built to stand the test of time, our powder coated railings are available in several beautiful finishes including black, oil rubbed bronze, and nickel. In addition, there are several handrail pairing options available to accent the wrought iron. 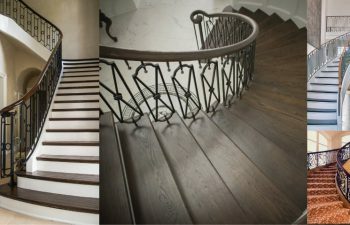 Whether you prefer powder coated metal, custom bronze elegance, or a specific wood species, your curved staircase and handrail system will exude quality and class. From Boston to Beverly Hills, our team has proudly designed, constructed and delivered signature and luxury projects in commercial and residential spaces nationwide. Our innovative, industry-leading approach leverages the expertise of our creative, cutting-edge design team and master craftsmen who hand forge the ornamental pieces with great detail and precision. Although the styles and design options vary widely, our team employs a proven approach within each project. With a robust project management system and a commitment to quality, our popular and custom wrought iron railings and curved stairs are delivered with flawless execution. Visit our wrought iron handrail project gallery for additional details and pictures on our exquisite projects. From inspiration to installation our team is committed to designing and building the highest quality custom stairs. Our reputation speaks for itself and client satisfaction is our highest priority. Contact us today to discuss your next ornamental metal project.